It's Monday again and of course, that means it's time to link up with our sweet Carissa and share our random thoughts. We celebrated Easter with Hanna Beth and her Dad and Mom on Friday afternoon and evening. We hid eggs for her to hunt, grilled steaks for dinner and then had a piece of that cute bunny cake. Can I just say that she loved her Bunny Cake! I must confess that I did NOT make it but rather the local bakery. I was going to make one myself and stopped in the bakery to get a board to put it on when I made it and they had one of these on display. When I saw it, I just couldn't resist ordering one rather than making one. Saved a lot of fretting and frustration I'm quite sure! If you are still old fashioned and have a home phone like we do then you need to know about this little gadget. It is the cordless headset by Plantronics. I have had two in the past 8 years and I clip that little fella on my waist or wherever and never miss a beat while I'm talking on the phone. I love to multi-task so it is perfect for me. It has a small loop that fits over the ear (the one I use) and the one that you put across your head like a headband. My main use is in the mornings when I am on the treadmill and our daughter calls for her morning visit. And, it is super wonderful if you have to call somewhere and are put on hold for an eternity. I just recently put these two together and oh, me, it is some good eating for breakfast. Put with a good cup of hot coffee and there's no better way to begin your day. 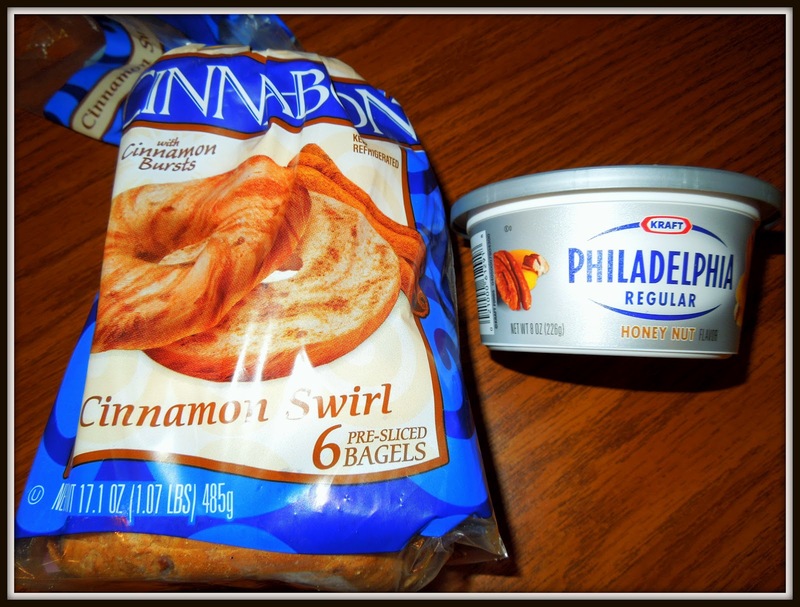 The Honey Nut Cream Cheese is more than yummy! And, my new lunch favorite is this sun-dried tomato pesto with thinly sliced smoked turkey on one of these Sandwich Thins. And, talk about low calorie and still filling. Yep! I love it! We celebrated Easter with our Dodge City family via the mail and pictures. 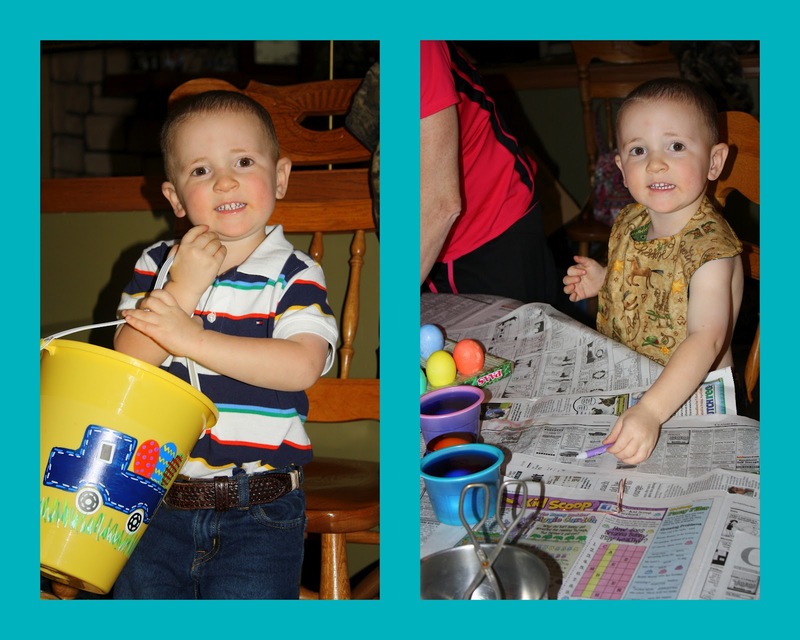 I sent Clancy a "goodie box" and then his Momma shared pictures with us of his egg dying experience and egg hunt. I asked her why the bib and nothing else on in the picture above and she said that he had on a nice shirt and she didn't want egg dye on it, so she just put a bib on him. Smart gal! and thank you for the great tips. That bunny cake looks adorable! Certainly a lot less work than trying to make one yourself, I'm sure. I've never tried honey nut cream cheese, and the Cinnabon bagels sound awesome ... what a delicious combo! And that sandwich sounds good ... I'm in a rut with my lunch, so that sounds like a yummy way to shake things up! Have a fantastic week! Looks like you had a wonderful celebration ~ the cake is adorable and so are those grands. Have a good day! That Clancy is too cute! Have you had a nice Easter. 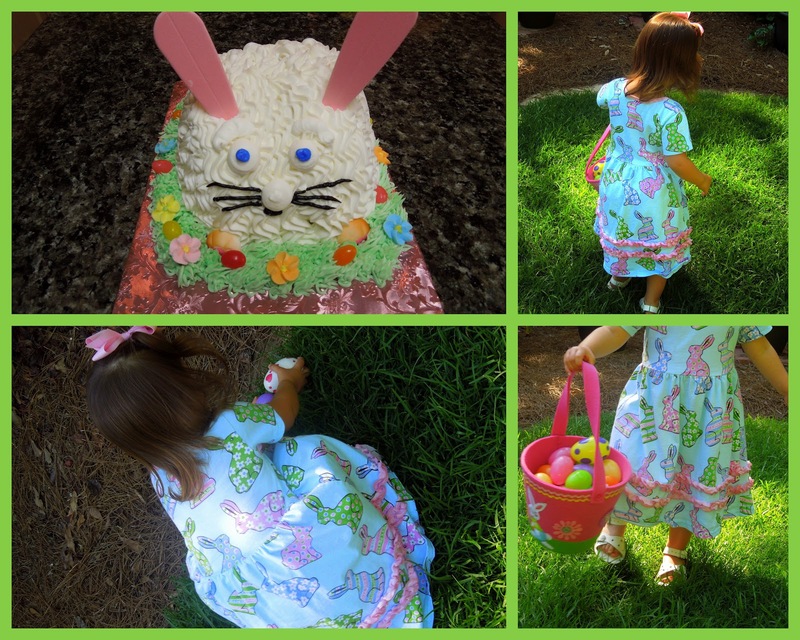 What an adorable Easter dress! I love those sandwich thins too. 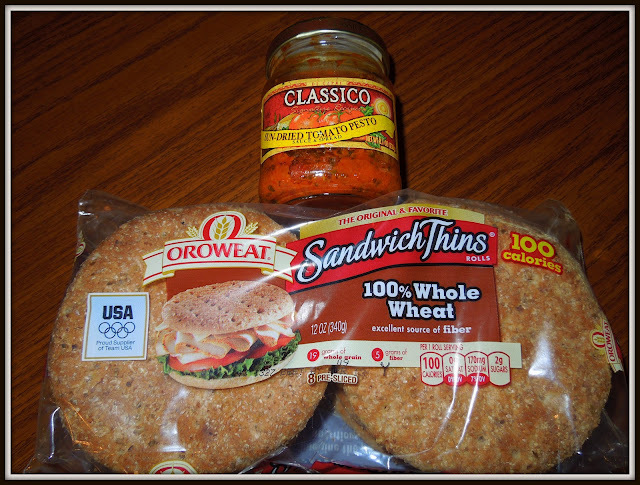 I pack a sandwich each day to take to work. But the tomato pesto sounds tasty. I may try that with smoked turkey as you suggested. Something different instead of my every day chicken salad. So happy to hear that your Easter was a special one! Ours was, too, for many reasons! Brittany came home from college, so that made it even more wonderful! Nothing better than being together as a family! Love your pictures! So much fun to have a little one around for Easter. I love her dress. I love my land line, hope they never go away. I will have to check out that cordless headset. Love your new favorites, they sound yummy! Sweet pictures of Clancy too.